In the previous part, you got some insights about how a brand new project can be managed. To be honest, starting a new project from zero and executing the plan without any emerging task happens once in a blue moon. The reality is that a PM has to manage running developments with emerging tasks (ideas, feedbacks, modifications). We’d like to give you an effective workflow template to handle new tasks without disturbing development’s rhythm. Now create a list where emerging ideas will be collected. The simplest way to handle them is an “input queue” list. You can create a sophisticated workflow for processing inputs by adding “analyze” and “implementable” lists. This workflow is useful when new items are detailed and/or appear frequently. This solution separates emerging ideas from the scheduled tasks and keeps dev process uninterrupted. Although finished tasks give good opportunity to rediscover and improve your product, we’d give you a workflow template for actual and scheduled tasks. Therefore clean your board out and archive finished tasks. Less task on board helps your team to stay focused. Remember, keep your Trello board organized. This is not just about how to trim your lists at the beginning of the process. Don’t let the “done” list flooded. Hide tasks from subsequent releases by archiving them. First things first, import cards into the story map. StoriesOnBoard will organize tasks into columns for a better view. Keep in mind, importing tasks won’t disturb existing releases and assigned cards. New tasks will appear always in “unscheduled cards”-release. Although only one Trello board can be connected to a story map, StoriesOnBoard handles every import separated. It’s time to create the product’s backbone! 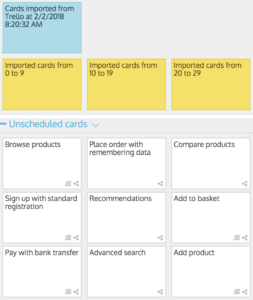 Create user and activity cards on the top of the story map, then organize imported tasks under them. When all cards removed from Tello import-block, delete it. Hint: Don’t forget to always remove empty import-blocks for a better overview. Now, the tasks are still unscheduled, so create the first release and name it “current release”. If you don’t have any release strategy move the highest priority and running tasks to this release. Using MoSCoW prioritization try to organize remaining cards under a “must have”, “should have” and “could have” releases. 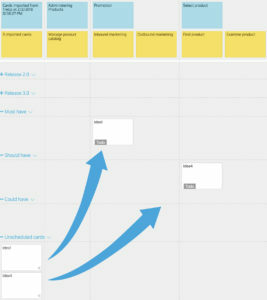 When the tasks are grouped and scheduled based on a former backlog, implement that release strategy into the story map. Creating the three prioritization releases is also advisable in this situation. Using prioritization releases has two main importance in agile development. Add new items (ideas, customer feedbacks, tasks) into “input queue” list. 2. Import accepted cards and empty the “implementable” list. 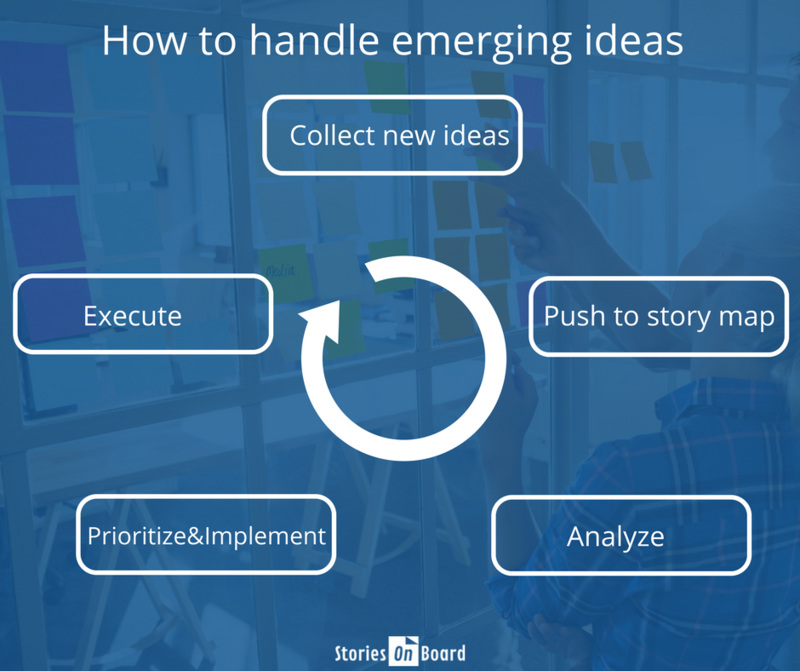 The best method for this process is importing ideas just before the release planning. Don’t let your lists flooded, empty the input queue. 3. Analyze ideas and remove them, when they are out of scope. Move accepted tasks to “implementable”. If you don’t want to remove permanently a rejected idea, then keep it in a “won’t have” release. Create an “Analyze” release if the analyzing process is separated from importing process (e.g. : you analyze ideas by a brainstorming). Keep imported cards in “Analyze” release until analyzing them. 4. 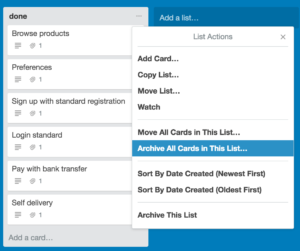 Push cards to Trello. Note: If you would push a formerly imported and/or archived card, click on “go to linked card” and restore it. Definitely yes! While a scrum team is working on a sprint scrum master can collect feedback and ideas. SM keeps unscheduled and unestimated tasks away from the dev team and avoids losing the pace. Adds estimation and organizes new tasks at sprint planning. Now we gave you impressions of how to manage a new project. We introduced how to handle and implement emerging into product’s development. But what about the old backlog and finished tasks? They are useful and helps you to rediscover the product. What does it mean? Follow us in the next part to get ideas about how to perfect your product’s plan by rediscovering.